Scroll down this page to view our Toy Cavoodle Puppies For Sale. All of our Cavoodles are Vaccinated, Wormed, Flea Treated, Microchipped and DNA Health Tested for over 30 different Genetic Diseases. Each of our Cavoodles also include a 3 Year Health Guarantee. If we don’t have any Cavoodles available at the moment or if you would prefer to wait for our next litter of Cavoodles please subscribe onto our notification list please click below. What is a Cavoodle or What kind of Dog is a Cavoodle? A Cavoodle is a cross between a Cavalier King Charles Spaniel and a Poodle. A Toy Cavoodle is a cross between a Cavalier King Charles Spaniel and a Toy Poodle. A Miniature Cavoodle is a Cavalier King Charles Spaniel cross with a Miniature Poodle. Do Cavoodles shed hair? Cavoodles shed less hair than most dogs. Some Cavoodles will shed no hair at all while others can still shed a small amount of hair. How big is a Miniature Cavoodle? Miniature Cavoodles are between 33cm and 40cm (approximately) in height. Miniature Cavoodles weigh between 9kg and 18kg (approximately). Chevromist Kennels rarely breed Miniature Cavoodles. How much does a Cavoodle Cost? Well bred Cavoodles will cost between $4000 and $5000. All Chevromist Kennels Cavoodles have been DNA health cleared for over 30 different genetic health issues and are Vaccinated, Microchipped, Vet Checked and come with a Health Guarantee. Regardless of where you choose to purchase your Cavoodle from it’s best to make sure the breeder does screen for health issues and the puppies are vaccinated and microchipped. They should also offer some kind of health guarantee. A well bred Cavodles is in the lower risk category for developing health issues, hence it is one of the most affordable breeds to insure. Are Cavoodles Aggressive? Cavoodles are not aggressive. 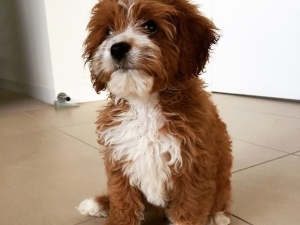 Cavoodles are a hybrid of a Cavalier King Charles Spaniel and a Poodle. Cavalier King Charles Spaniels are well known for the very gentle nature and are probably one of the least aggressive dog breeds. A well bred Cavoodle should retain the gentle nature of the Cavalier King King Charles Spaniel. Are Cavoodles good breed for children? Cavoodles make excellent family dogs and do great with kids. Cavoodles are gentle, patient dogs so make fantastic dogs for children. Are Cavoodle Hypoallergenic? Because Cavoodles are crossed with a Poodle they do make often make better dogs for people with allergies however allergies are not caused by a particular type of coat but by dander (dead skin cells) which all dogs drop (and humans for that matter) but Cavoodles like other Poodle crosses shed less of. Which dog is fantastic with kids and other pets, is obedient, intelligent, loyal and sheds very little hair if at all? Well the Cavoodle of course! Cavoodles have probably become Australia’s favourite breed and it’s really no surprise why. They are an all-round great family dog. Cavoodles are the result of crossing the Cavalier King Charles Spaniel with the Poodle (usually toy or miniature sized). Most of our Cavoodles are the toy sized Cavoodles which are smaller than the miniature sized Cavoodles, however, the miniature Cavoodle is still a small sized dog. 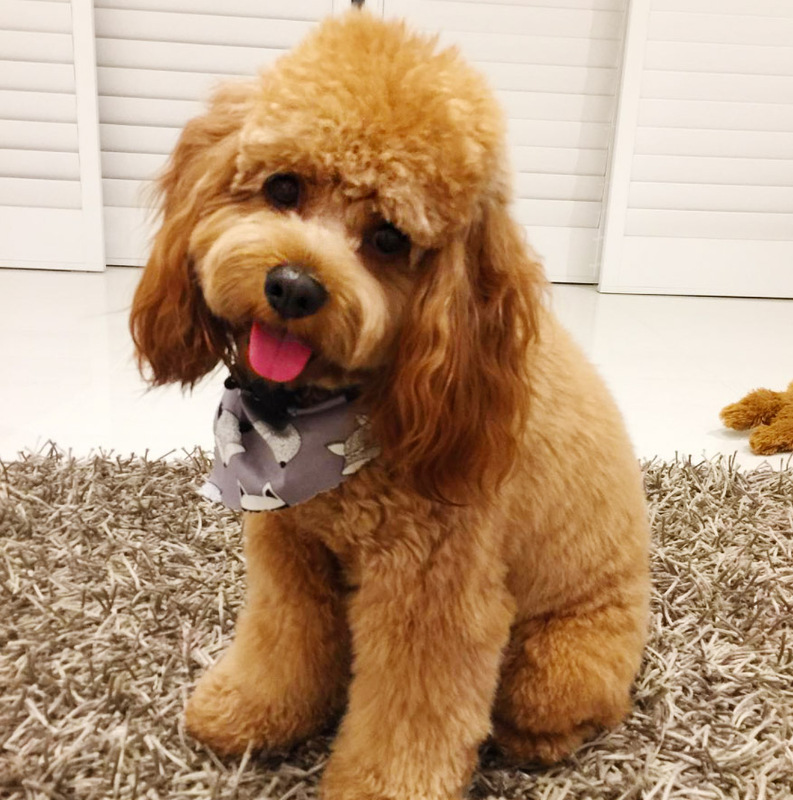 The Cavoodle inherits it’s intelligence from the Poodle which is known to be one of the most intelligent and trainable breeds while it’s soft and sweet nature comes from the Cavalier King Charles Spaniel. Cavoodles respond well to positive training. When focusing on negative behaviors try to focus on how a dog expresses its natural instincts rather than scolding or yelling at he or she. Now while the Cavoodle is quite intelligent they are sometimes prone to becoming distracted so during training sessions try to find a place without too many distractions and keep the training sessions short. Most of our Cavoodles go to homes with children but are equally just as suitable for single people as well. Many of our Cavoodles also share their homes with other pets including other dogs, cats, rabbits and birds but it’s important to supervise them while they are young puppies to make sure they don’t pester other animals like rabbits which could cause the animal to over stress. Unlike some other designer breeds such as Labradoodles and Groodles, the Cavoodle is normally a first cross or ‘F1’ generation dog meaning both parents are purebred. Breeders have found that the first cross Cavoodle is the ideal Cavoodle. Compared to second, third or multi-generation Cavoodles it’s much easier to determine what a first generation Cavoodle will look and behave like. Once breeders start to breed past the first generation we start to see much more variation within the litter produced so some puppies may have the Poodle coat while others in the same litter will have the Cavalier coat etc. Toy Cavoodles grow to be between 28cm-33cm at the shoulder while Miniature Cavoodles are between 33cm and 40cm at the shoulder. The Cavoodle coat is normally a soft, wavy, free flowing coat which will shed very little if at all. How much maintenance does a Cavoodle’s coat take? Well that really depends on how long you prefer the coat. Because the coat doesn’t shed like an ordinary dog the coat will need clipping. Most Cavoodle owners clip their dog’s coat once every 6 to 12 weeks. This can be done yourself or by a professional groomer. The longer the coat the more brushing is required. However, if the coat is kept relatively short than the occasional brush is all that’s needed. 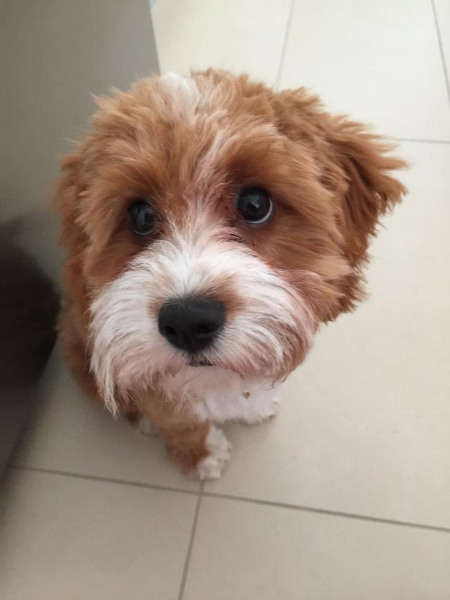 Wherever you and your family decide to purchase your Cavoodle from it is vital you choose an experienced Cavoodle breeder. Cavoodles are probably the most popular small family breed in Australia due to their easy care, low to non-shedding coats, fantastic temperaments and of course because they are just so cute! Unfortunately due to their popularity we’ve seen puppy farms and backyard breeders who see a quick buck to be made now breeding Cavoodles as well. Although puppies from backyarders and puppy farms may seem cheap, Cavoodles that come from such places will often have serious health and behavioural issues leading to very expensive veterinary bills and a lot of heartache for their owners. Puppy farmers and backyard breeders don’t health screen their dogs and will breed any Cavalier King Charles Spaniel with any Toy Poodle regardless of the outcome. A good Cavoodle breeder should be experienced, have a quality, and well run kennel facility that undergoes regular inspections by their local authority (i.e. local council officers) to ensure they are abiding by what is in Victoria, the strictest laws and codes for dog breeding anywhere in the world. A good Cavoodle breeder should also have a formal education in Animal Science and/or Animal Genetics to properly understand how to breed Cavoodles with the desired traits one is breeding for i.e. low to non-shedding coat, health and temperament. Michael Attard is always our first point of contact when planning a new litter of Cavoodles at Hepburn Park (our kennel). Michael has been involved in dog breeding all his life. He completed his degree in Animal Science with a focus on genetics, then went on to complete his Honours work in immunology through Melbourne University’s Dept of Medicine and the CSIRO Australian Animal Health Laboratory. While we are very fortunate to have Michael as well as very experienced veterinarians to consult with, any professional Cavoodle breeder should have a professional formally educated in animal genetics to consult with when planning a new litter of Cavoodle puppies to ensure the correct Sire and Dam selection for each litter.